Reading and telling ghost stories is a Christmas tradition in many countries including Britain and the United States of America. The tradition of Christmas ghost stories probably dates back to pre-Christian times, when Yule and the Winter Solstice were thought to be associated with evil spirits. Probably the most famous Christmas ghost story is "A Christmas Carol" written by Charles Dickens in 1843. It tells the tale of Ebenezer Scrooge, a mean and miserly old man. 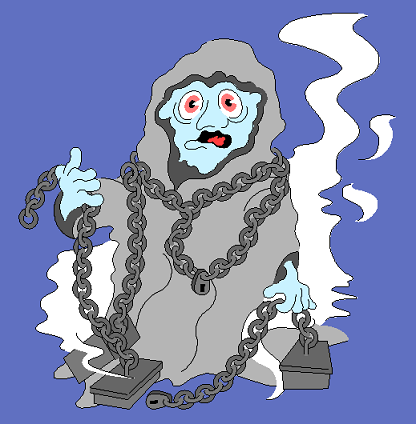 In the story, Ebenezer Scrooge is visited by the ghost of his dead business partner (Jacob Marley), and then by three Christmas ghosts (the Ghost of Christmas Past, the Ghost of Christmas Present, and the Ghost of Christmas Yet to Come). The ghosts all try to turn him away from his wicked ways, and being a Christmas tale, as you might expect, the story has a happy ending. There have been numerous adaptions of "A Christmas Carol" on stage, on screen (TV and film), and in books. Additionally, words and phrases from the novel have entered orindary English - for example, a miserly person is sometimes described as a "scrooge".